As far as I can see, this time of year is notable for only two things – Groundhog Day and the Architects Registration Board’s annual plunder of £86 from my bank account in exchange for an entirely useless membership card. I was in fact beginning to think they were one and the same thing since, like the Groundhog, the ARB manages to remain pretty much invisible for the remainder of the year. That was until a missive from the Electoral Reform Service dropped through the door telling me I could vote for seven new Board members who would serve for the next three years. Quite who they will serve is a moot question though – of the 20 candidates who have provided election statements, almost all want to ‘reform’ the ARB towards a severely protectionist agenda whose sole purpose is to hang by the thumbs any non-qualified person who takes it upon him or her self to use the title ‘architect’. Some candidates also represent vested interests in the world of architectural education whilst others wish to rid the Board of Privy Council appointed members and restrict it to architects only. And, as usual, there are a few old codgers running for election because they need the expenses that come with attending meetings in London. In truth, there is not a single one of these election statements that does not make for depressing reading and indeed it’s a sort of Groundhog Day exercise in itself to try to find anything in them that wasn’t in the papers that came for the previous election and the one before that. I confess I tend to think of the ARB retention fee as the TV licence of the architectural profession – an archaic, unnecessary tax irrelevant to the digital age in which we now live but which we are obliged to pay to keep a small bureaucracy employed in utterly pointless tasks. Just think - if all 30000 or so UK registered architects refused to vote, in only a few years we could be free of ARB Groundhog Days. I for one would not feel any the worse for the loss. Marching swiftly on, the latest announcement from the Bell’s Brae public relations machine is one of its most intriguing yet and says more about the future direction of one area of the architectural profession than ARB candidates’ statements ever will. RMJM, of course has always had broader horizons than most, but the creation of a new practice role – that of ‘director of global emerging markets’ – shows there are now no brakes on the company’s ambition to rebuild the world in its own image. The new man, Nick Haston, hasn’t had to trouble himself with anything as irrelevant to this task as ARB registration – nope, Nick’s a former Sandhurst man whose cv reveals he has held down key roles in military operations in Iraq and Afghanistan, places where his talents as “a hugely influential communicator and networker” will no doubt come in handy when it comes to negotiating reconstruction contracts on behalf of the practice. Not that he’ll be standing still for too long – the rotors on the RMJM’ Blackhawk appear to be twirling to drop Nick into new market opportunities in Brazil, China, India and Russia as well as South America, North Africa and eastern Europe. Percipient readers will appreciate this doesn’t leave too much of the globe for anyone else: it’s a big task, so we shouldn’t discount the possibility of chief executive Peter Morrison asking all staff to share the load by wearing their underpants over their trousers. Not all practices are quite so supercharged and indeed, the continuing financial crisis has put to rest many well laid plans and ambitions as well as consigning a few good companies to the ‘aborted project’ section of the drawing cabinet. The latest practice to find itself in this sad but unfortunately not so lonely drawer is Glasgow-based MCM, the architects who memorably screened the city’s Waterloo Street multi-storey with chunky timber louvres that managed to make this unlovely beast a much more attractive part of the urban landscape. You can only wish the optimism that underlay the thinking behind that project will re-emerge in another form in the not too distant future. Another group of architects previously reported on in the Wrap has managed to do just that. Regular readers will recall me mentioning the various trials and tribulations of MAKE, or at least the Edinburgh outpost that found itself dropped from favour with Ken Shuttleworth, the company’s very own Clark from Kent. Ken found the work available at this end of the country to have a little too much embodied kryptonite for his taste and decided just before Xmas to step away from his northern telephone box and emerge, re-energised, from a new one in China. All well and good, except that our hero had a talented team at work in Palmerston Place, the members of which weren’t entirely delighted by a bonus that came in the form of a P45. So to today, and the emergence of a brand, spanking new practice – the Palmerston Place premises might look strangely similar and the personnel oddly familiar, but a completely new nameplate is on the door. Step forward ‘7N’ - an unusually cryptic acronym, I think you’ll agree, but at least it’s not a set of abbreviated initials from some old names trying to look modern. No doubt in due course this experienced team will reveal the meaning behind the moniker, but in the meantime they seem to have enough interesting work in hand to keep them pretty busy as well as the ambition to remain so for a long time. And, as for all new practices seeking to establish themselves in these turbulent times, the Wrap wishes 7N well and looks forward to new and interesting projects. 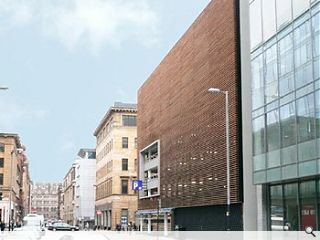 After being given the bum’s rush by the capital’s heritage groups as well as the National Galleries of Scotland for its scheme to erect a 25m plasma screen outside the Royal Scottish Academy on Princes Street and by the Edinburgh public for alternative proposals to mount it in Castle Street or Princes Mall, the good councillors of the city have now awarded themselves planning permission to locate it in the tumbleweed landscape of Festival Square. Given the various setbacks they’ve had regarding the installation of this completely unnecessary piece of technology, you’ve got to give the boys and girls in the City Chambers credit for sheer chutzpah – head of planning, John Bury, for example, is convinced the screen can bring huge benefits: “the encouragement of activity in the square as originally envisaged has the potential to enhance the character of the conservation area”. Now I know you’ll be as surprised as me to discover the Stalinesque Sheraton Hotel, the lumpy post-modern Clydesdale Plaza and the Mockintoshy office building on the south side of the square collectively form something that might even remotely be described as a conservation area, but John’s further comments to the effect that noise from the screen would be shut off after 10pm suggests he hasn’t actually been there and realised that the hotel’s residents might not agree the screen is such a good thing. More to the point, the very idea that the head of planning thinks the introduction of this plasma monster might solve the issue of a square that has never worked because nobody needs to cross it to go anywhere indicates that he may well be from the side of planning crowded with geographers rather than the one in which the denizens have even the teensiest understanding of urban design and architecture. And why, pray, do the good councillors think Edinburgh needs a humongous telly? Because, dopey, its part of being a ‘modern’ city and because they’ve been bought off by the proposal from the London Organising Committee (LOC) for the Olympics to pay the £500k required to install it, £200k for maintenance and security between now and 2012 and a further £100k for an annual lease. Yes, that’s right, a hundred grand a year for four years into the Council coffers – fantastic payback for all the Lottery money redirected from Scotland’s good causes to the Olympic beanfeast. And for the Council to be drip-fed this sweetie money by Lord Coe and crew, the screen has, for some mysterious reason, to be installed by 30 April of this year, hence the unseemly haste to find and approve a site. 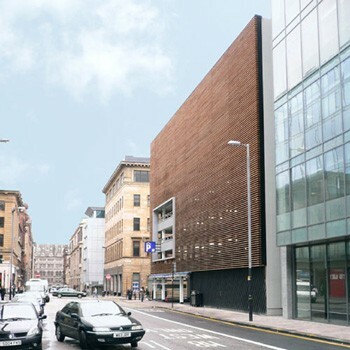 Of course, there is the other possibility that it’s all a cunning plan by the Council to forestall Richard Murphy’s annual press launch of his scheme for a new Filmhouse on this particular site by installing a cut-down, cut-price, naturally ventilated version. A man who has turned chutzpah into something of an art form, Clydebank émigré Stewart McColl has bounced back from being ousted from the SMC organisation (now restructured and rebranded as Archial) with a new outfit, this time with his full name attached. Robinson McColl has, apparently, six members of staff and no funding whatsoever but as ever with the big man, there is a plan to float on the Stock Exchange. Now most people in the current climate – if they’ve not already been stuffed by falling share values – would see it as prudent to keep at least a berth’s width of that august institution, but not our Stewart, who has impressive form in this area. In the space of two years following its foundation, 11 UK practices (including Davis Duncan, Jenkins & Marr, Hugh Martin and the Parr Parnership in Scotland) had been subsumed into the SMC Group and by December 2006 its share price had risen to 188p. Unfortunately not all was well on the accounting side of things and when in April 2008 the share price dropped to 10p, city sentiment forced the larger-than-life chairman to resign. You have to be impressed therefore by a man who only nine months later – in the midst of what the Prime Minister now agrees is a depression – has re-emerged with a plan to once again take an architectural practice onto the Stock Exchange, and with projects in countries as stable as Morocco, Iraq, Kurdistan – and, no doubt, every other -stan – could this be third time lucky (for we shouldn’t forget the original BDG McColl roller-coaster ride) for big Stew? I leave it to others to judge from the recent quote attributed to him: “…the City is interested in architects if the business plan is right”. As regards the kind of rapid acquisition strategy that was the hallmark of the SMC Group: “If there is a business faltering and we are able to make a good business case then we would not be averse to it. We’ll be opportunistic as we always have been.” That presumably being a Royal ‘we’, practices feeling financially vulnerable at this time might be well advised to keep their collective heads below the parapet and everyone else their remaining spare cash beneath the mattress. Last week’s mention of Legionella at Holyrood began life as an old story, in that news of the bacteria’s existence in Queensberry House had taken seven months to reach the Scottish press. The announcement came with assurances that the issue had been dealt with so nothing to worry about really. Except that it’s back – if indeed it ever went away. The Wrap did speculate that the problem had not perhaps been responded to with the urgency it deserved because MSP’s were off on their hols at the time and the only group at risk were Festival tourists on a tour of the policies so not worth worrying about, but this notion has been firmly scotched in the most recent announcement. No, this time I am delighted to pass on the news that the outbreak has been confined to areas of the compound into which visitors have no access. So, just to be clear, we are now assured that there’s no foreign legionella scaling the Parliament’s plumbing and consequently no call whatsoever for light-hearted remarks about the grubby shower at Holyrood.